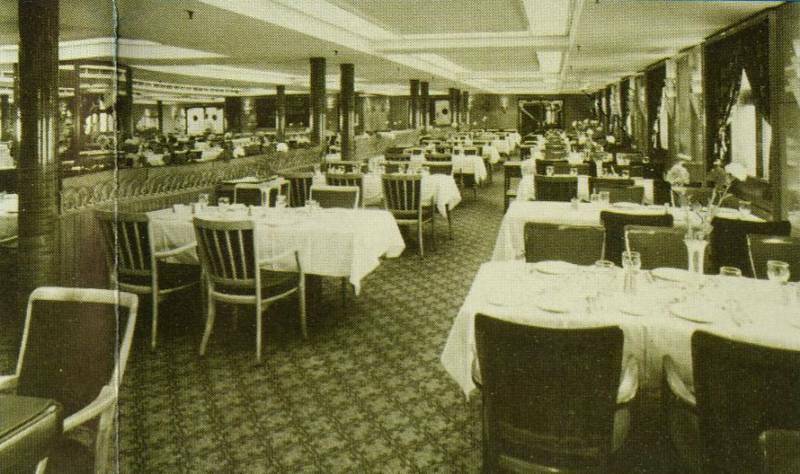 The largest and one of the most superb spaces on board the REGAL EMPRESS was the Caribbean Dining Room located on Restaurant Deck, aft. It's 548 passenger capacity encompassesd the full width of the ship and could accomodate the entire passenger load in two sittings. 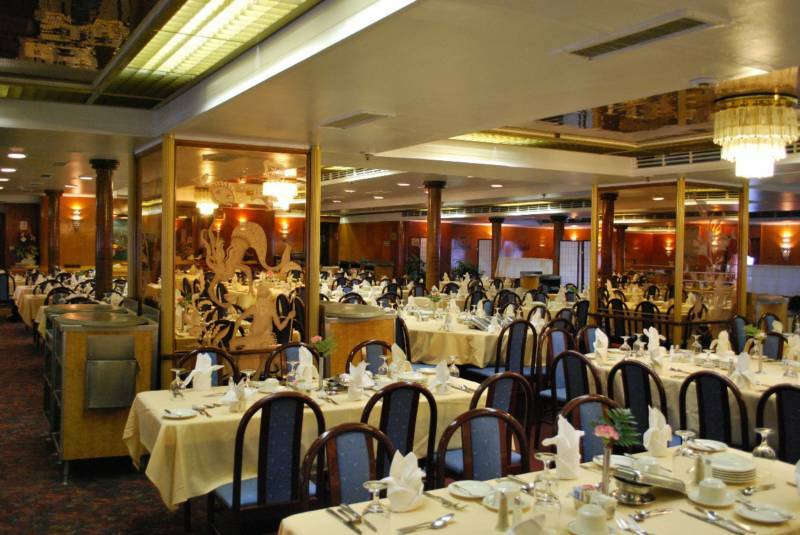 As seen by the following photos below, the room remained largely unchanged since the days when it suited the tourist class as the Olympian Dining Hall on board OLYMPIA . 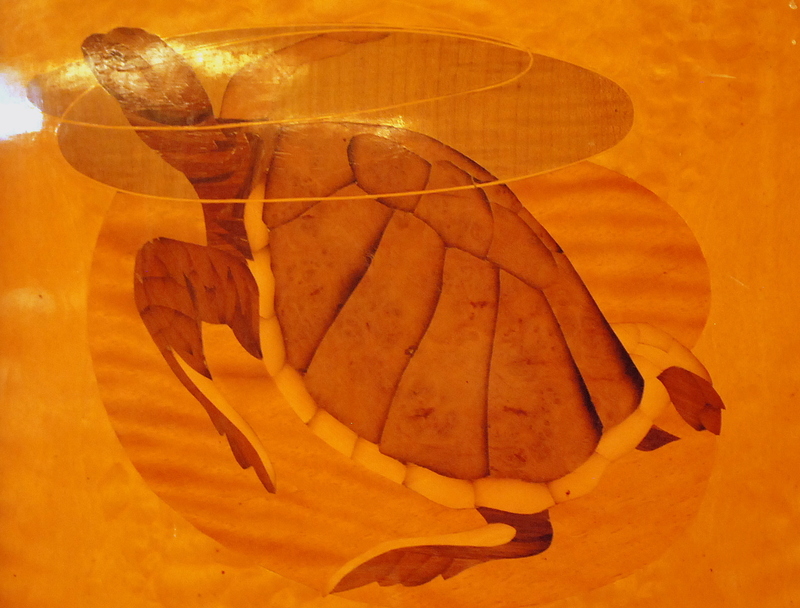 The most notable changes that took place were the carpeting, curtains, and the replaced forward painting(See History). The undeniable splendour of this room can be appreciated by knowing that the burled wood veneers bristling on thin rounded columns and bulkhead paneling, were original as is the etched glass panels with nautical touches of sea life. 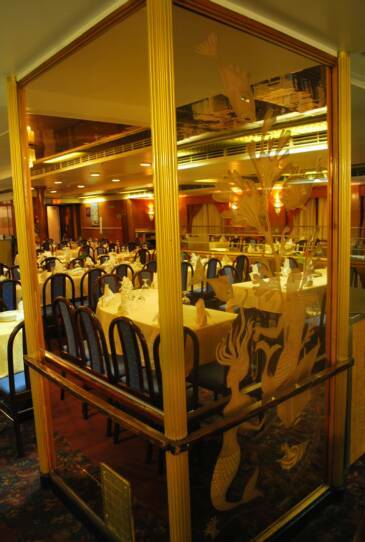 Looking aft of the Caribbean Dining Room, the etched glass, tables and some of the chairs are among the original items. 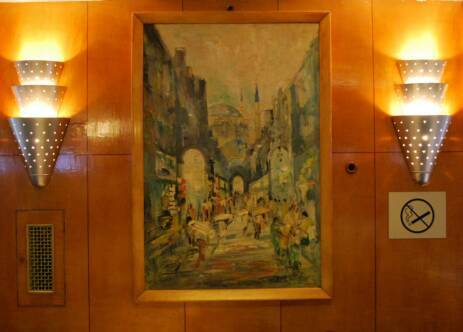 A series of all origina l- specially commissioned paintings, flanked by light sconces are echos of 1950's design. Detailed look at the etched glass paneling, this spanish galleon and mermaids definately add a nice maritime feel to the Dining Room..
Focal point- New York Harbor is the obvious liking here, sharing the bulkhead with a few sconces and an interesting clock. . The splendid sitting room of Suite F located on Upper Deck, looking port. 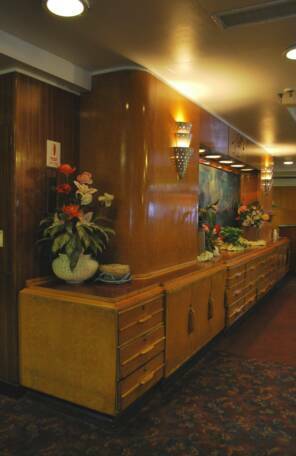 The same room - at nearly the same angle - remains virtually unchanged more than 50 years later on board REGAL EMPRESS. The bedroom for Suite E facing forward. 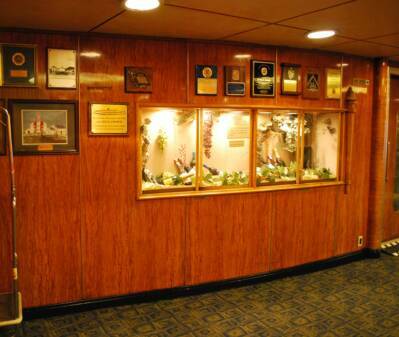 This suite was part of the former Almack/Card Room on board OLYMPIA as seen in the set of windows to the left from the black and white image above. The bedroom of Admiral Suite F on the port side, facing forward. 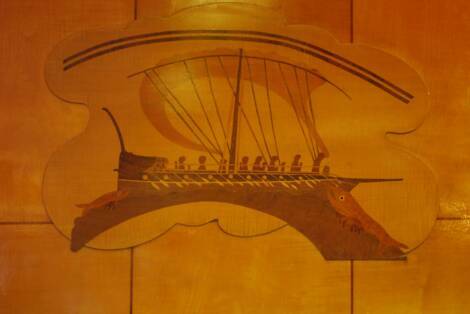 This suite was part of former Drawing Room onboard the S.S. OLYMPIA. 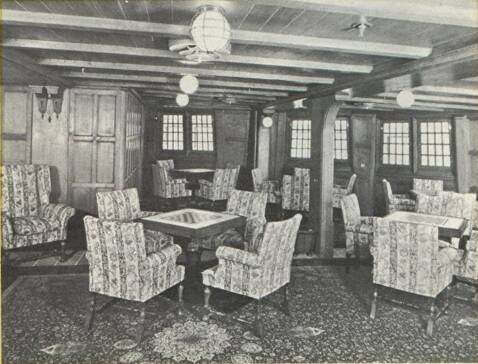 The sitting room of Suite E on Upper Deck. Also like its couterpart, includes a foldout sofa and storage space for four. 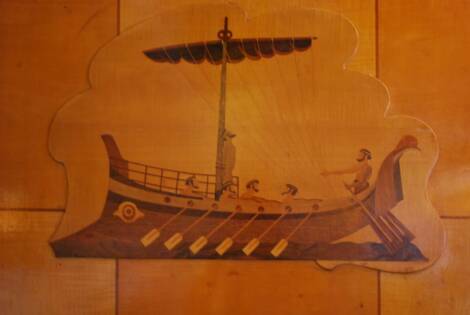 The Deluxe Mini Suite of U-91 on the starboard side, behind Suite E. Features an original painting from the OLYMPIA Card Room days. The Deluxe Mini Suite U-90 on the port side on Upper Deck. 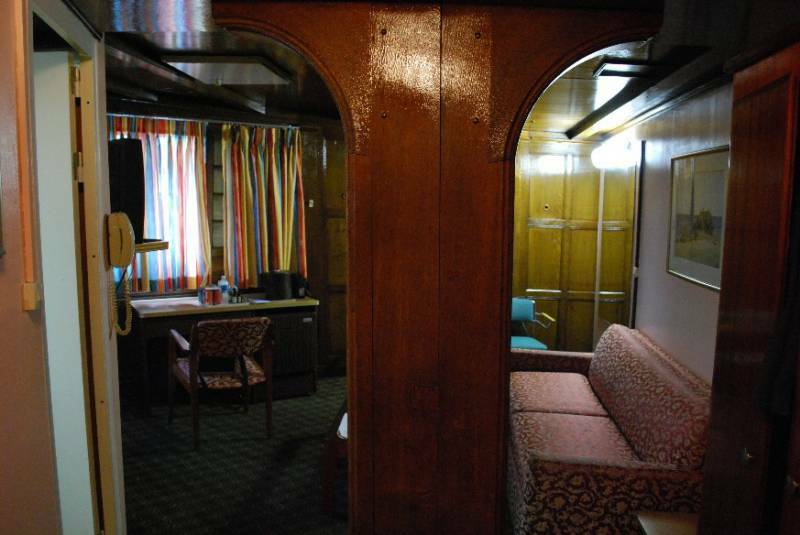 Located aft of Suite F, also contains paneling from the Drawing Room. Almack/Card Room circa 1953, the center post just off the center of the picture is the same one that appears in four pictures down in the sitting room of Suite E.
This passageway leads to Suite E to the right. 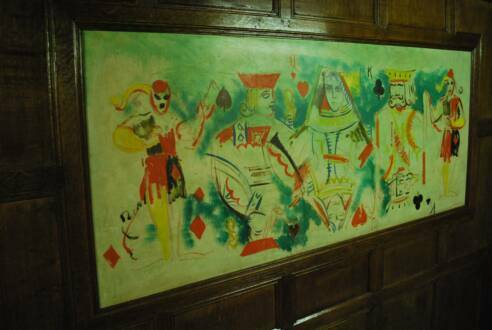 This is the section of the Almack/Card room that appears to the left of the above photo. 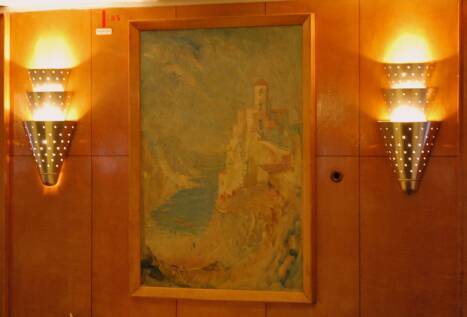 This painting of the 'Jack, Queen and King' was part of the Card Room, and has remained onboard surviving in Mini Suite U-91 on the aft bulkhead. 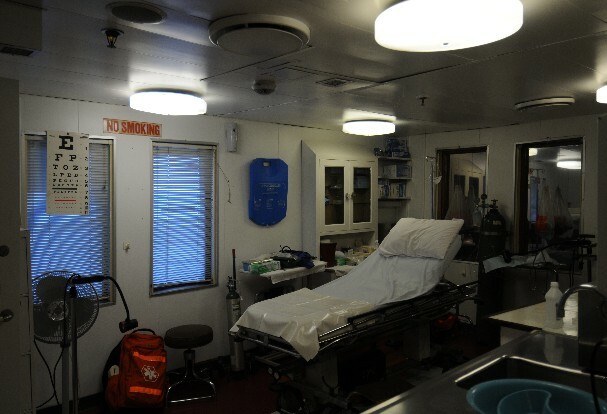 Cabin U-93 on the starboard side looking starboard, room for four passengers. Purser/Upper Deck lobby looking forward. The large model of the ship was located to the left of the photo, taken off from her return to service in December of 2008. Looking aft from the landing on the ladderwell between Upper and Promenade Decks. The former cinema of OLYMPIA became what was later occupied by the Mirage Disco, looking forward. Looking aft of the Mirage Disco from the projection screen. Notice the gold colored overhead, what remains of the upper balcony of the Cinema from Greek Line days. The Grand Lounge looking forward on the port sidee. Entrance point for all passengers, and the former First Class Entrance Hall looking port. Upper Deck to Main Deck on the small stairwell that appears towards the left of the above photo. Two views of the former Small 1st Class Dining Room- facing forward (left) and aft (right). 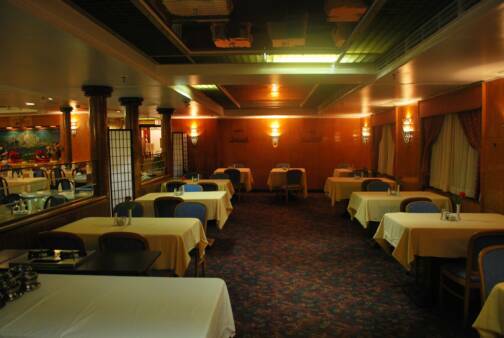 This delightful room survived all of the major refits of the ship and became the Officers Dining Room. 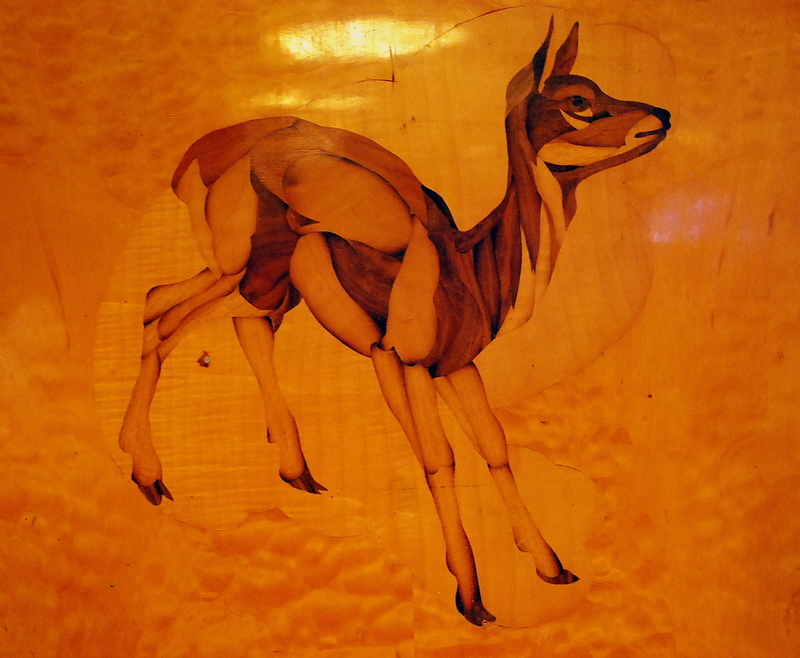 Its charm rests in the original maple wood paneling and inlay artwork as well as brass doors. 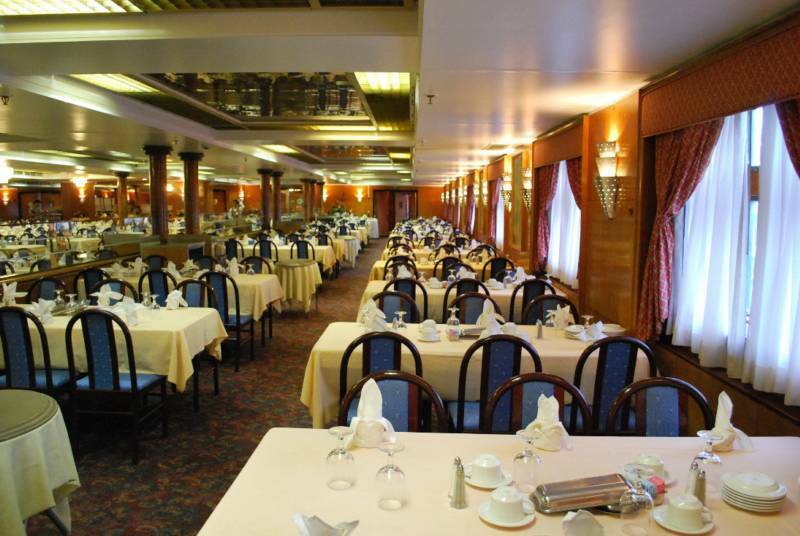 The chairs also dwell from the former Imperial Majesty Cruise Line ship, the OCEANBREEZE. 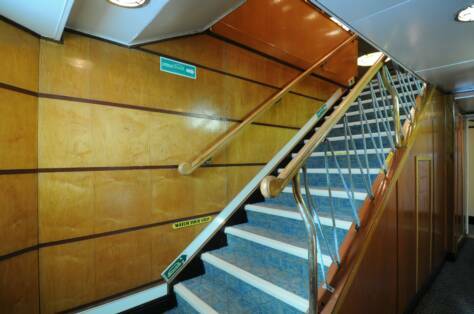 Facing forward along this bulkhead were the several plaques honoring port visits for the vessel. 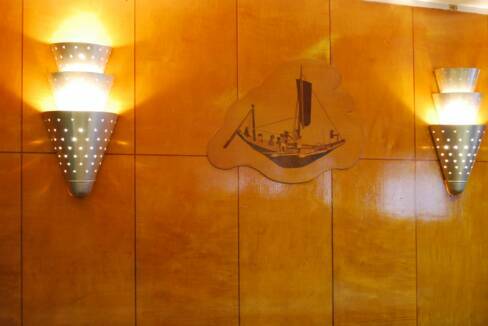 A study of 1950s maritime decor, one of many sconces from the Caribbean Dining Room. This aft lobby separates the Boutique shop and the Monte Carlo Casino. 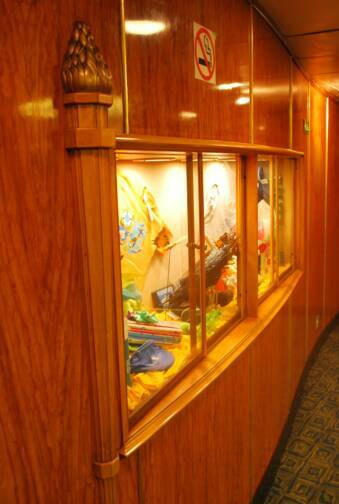 The same lobby looking starboard towards the Gift Shop and the stairwell that leads to the cabins on Main Deck. This intersting stairwell near the Monte Carlo Casino leads to Main Deck. The former Derby Room from Greek Line days is now the Monte Carlo Casino. 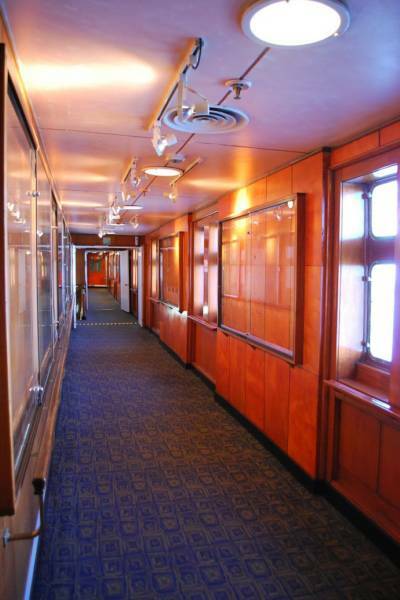 Looking aft towards the Photo Gallery and the Dining Room, as well as the stairwell that leads down to Main Deck. Looking forward at the Photo Gallery and towards the Officers Mess and Main Entrance hall. 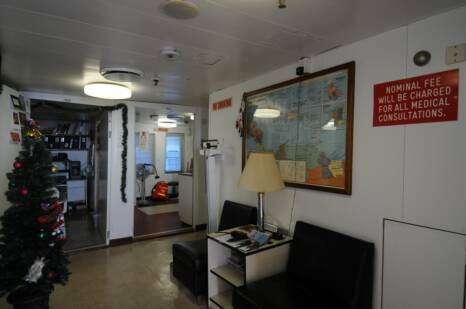 Looking forward on the portside of cabin A-12, this is a Category 6 cabin on A Deck. Looking forward in cabin B-11, a Category 10 on B deck. 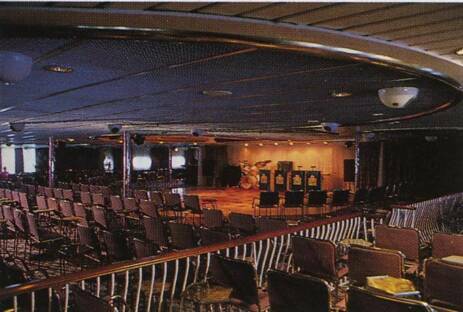 The same lounge from the starboard side looking port and forward during Commodore Cruise Line days. Brochure picture, Rob OBrien collection. 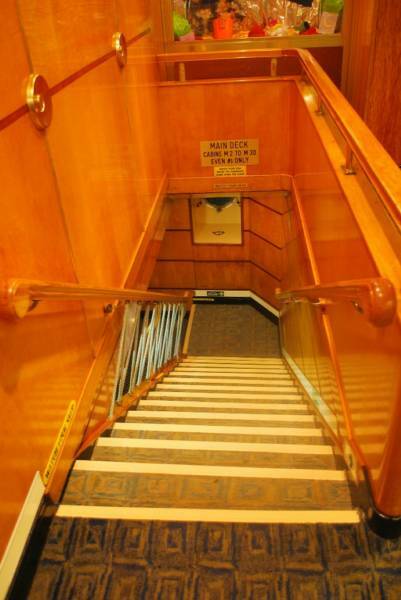 The aft staircase, cascades from Upper Deck to Main Deck and narrows down to the last passenger level on B Deck. The brass railings, wood paneling & cloud sky murals make this most unique. The Fantail with emergency aft steering station looking starboard towards Fort Lauderdale, Florida. This unique water fountain was located at the Main Lobby next to an elevator and Cabin R36. 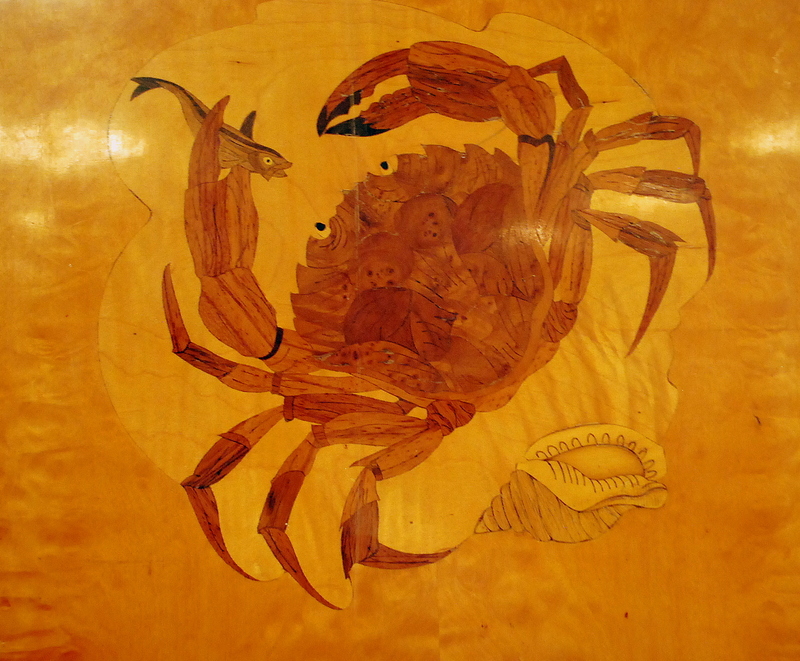 The aft bulkhead also features a few of these surviving pieces of art, here inlays of the crab and fish. 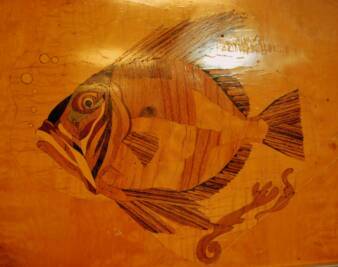 The Tourist Class Dining room also got the same treatment in hardwood marquetry as the Small 1st Dining Room. As featured in the images below. Beneath the painting, sconces and dragon clock was a series of these drawers. 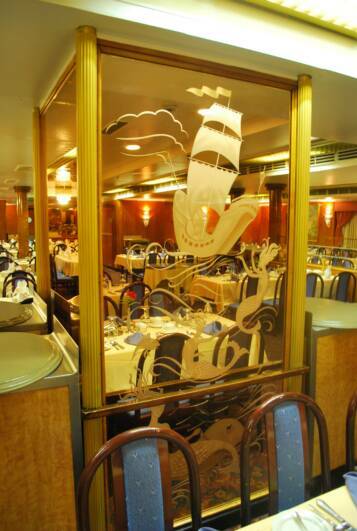 Gourmet dining in the Caribbean Dining Room, a sectioned off corner located aft and port. 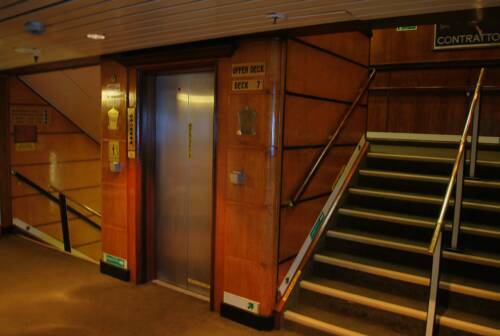 An aft stairwell and elevator, notice the Greek Line eblems that flank the elevator door have long since worn off. The brass plate(inset) remained nevertheless. 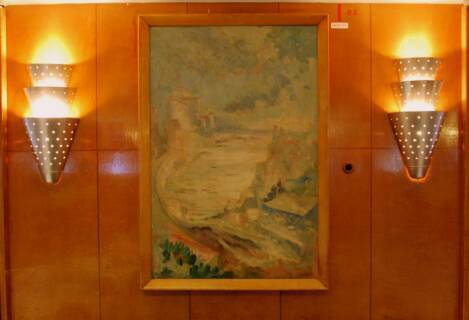 The 'face card' painting, part of the original configuration of the room, looked towards the Suite E and U91. 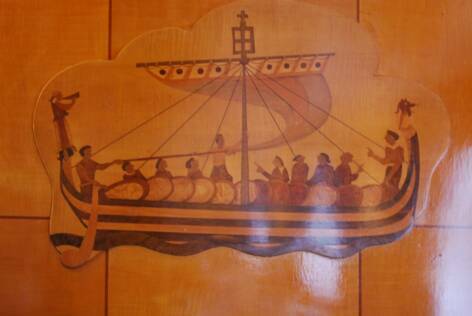 This River painting scene was on the port side on the bulkhead side of Suite A.
Passageway looking forward of the starboard side.This series of cabins took the place of the original Zebra Room and later Calypso Room in the 1982/83 refit. Each of these inlays were also flanked by sconces, once again this worked extremely well in this space and were tucked away in a few corners of the room. 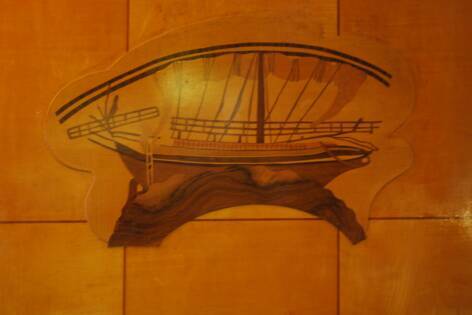 Details of original wood decorations and paneling from the former 1st class entrance as OLYMPIA was smartly used to display souvenirs and wine bottles.